It’s my absolute favorite time of year! Most of my friends love the fall, but I just adore the newness and freshness that spring brings. And in the area of the country that I live in, the absence of lush green life from November – February makes you that much more appreciative of every tree, bug and sunshine when spring rolls around! 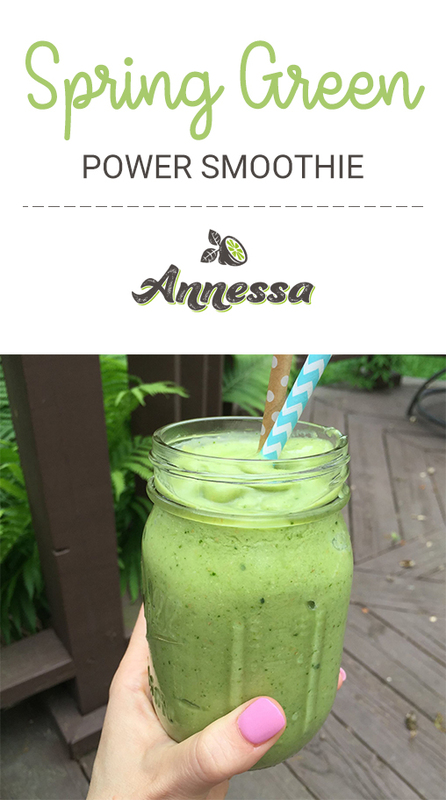 This green sidekick carries some muscle – it has 91% of the vitamin A you need for the day! Thanks to fresh spinach for that. …and the protein powder, is optional, but recommended for boost to give you endurance for the rest of the day! Think of this kind of smoothie as a high-energy meal replacement. I hope you enjoy it as much as we enjoy spring! Leave me a comment and let me know what you think! 1.) Add the coconut milk and spinach to a food processor. Blend until the little leaves are completely smooth (or almost completely smooth). 2.) Add the rest of the ingredients – scoop the avocado straight in, and blend until the drink is a bright, pretty green. Enjoy! Nutrition facts without protein powder: calories: 245, total fat: 9.9g, saturated fat: 1.6g, polyunsaturated fat: .6g, monounsaturated fat: 1.7, sodium: 101mg, potassium: 898mg, carbohydrate: 39g, fiber: 9.3g, sugars: 6.6g, protein: 7g. Nutrition facts with protein powder: calories: 345, total fat: 9.9g, saturated fat: 1.6g, polyunsaturated fat: .6g, monounsaturated fat: 1.7g, sodium: 252mg, potassium: 1,288mg, carbohydrate: 39g, fiber: 9.3g, sugars: 6.6g, protein: 32g. Downloading the software and setting it up on your pc is the first step. two solutions to remodel your drivers. What is worse, it may lead to computer freezing, blue screen and even crashes.